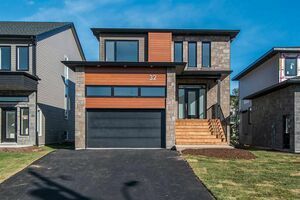 IN05 32 Innsbrook Way, West Bedford (MLS® 201901825): **UNDER CONSTRUCTION**This 'grand foyer' latest design by Cresco is a modern yet cozy floor plan with 4 bedrooms, 3 full bath + powder room and is heated with a fully ducted heatpump with natural gas. Fully upgraded this home has tons of pots light, and hard surface coutertops in the kitchen, powder and ensuite. Main floor starts with a stunning 2 storey front entrance, large kitchen with pantry and oversize island, family room with fireplace and built in shelves, living room with double windows, mud room off of the garage and a built in and 24 x 12 deck. Second level includes master bedroom with luxurious ensuite, large walk-in closet, 2 other spacious bedrooms, full bath and laundry room. Lower level has 4th bedroom, full bath, very large recroom and plenty of storage.